Country Chic Paint fuels the creativity of DIYers with thoughtfully designed, environmentally-conscious products. With a dedication to a positive work culture and sustainable business practices, Country Chic Paint creates more enjoyable living spaces. Country Chic Paint is the type of small business success story everybody loves. Founded in 2014 by husband and wife duo, Jan & Roseanne Korteland, after immigrating to Canada from their native Netherlands, Country Chic Paint quickly grew into a favourite among passionate DIYers. Appearances on Dragons’ Den and a wide variety of industry publications helped the duo build brand awareness and consumer interest, while partnerships with Shopify and Okendo have provided the technology platform for scaling retail operations and the building of an online customer community. Country Chic Paint is an example of how store growth can be achieved even when already operating at high performance. Even prior to Okendo, Country Chic Paint had a well developed customer content marketing strategy that was effectively driving new traffic to their online store, building shopper trust and confidence and building loyalty among customers. 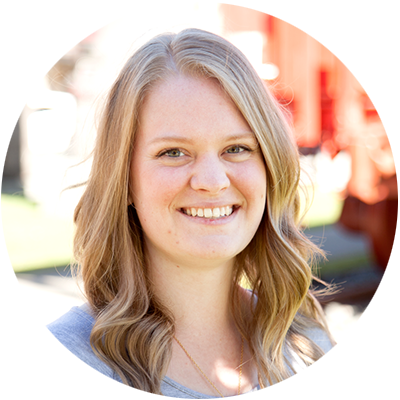 As such, when Okendo approached Country Chic Paint with an offer to further optimise their customer content program, marketing coordinator, Sarah Archer, could be forgiven for, at least initially, being a little sceptical. The reviews Country Chic Paint were generating prior to Okendo, although plentiful, were still tending towards the one liner and basic star rating type of review. While useful for providing a signal to shoppers that Country Chic Paint was a trusted brand, they weren’t providing insight into the specific product dimensions shoppers were looking to understand, such as how easy to use the products were or what the expected final results of a product might be. The reviews were anonymous, with no indication aside from initials as to who Country Chic Paint’s customers actually were. Finally, the site widgets of Country Chic Paint’s old reviews app were less than beautiful and were simply not doing justice to what was an otherwise beautifully designed web store. “Our previous Shopify customer reviews app was great in many ways; we were generating reviews each month, reviews were tied to coupons which was motivating repeat purchases and reviews were having a measurable impact on conversions. So when Matt from Okendo told me they could improve our review program I wasn’t initially convinced”, remembers Sarah. She continues, “However, once Matt introduced us to Okendo’s product attributes feature and how this could be used to significantly improve the quality of reviews we were receiving, it became quite apparent to me that we had room for improvement”. With several key areas of improvement identified, Country Chic Paint worked with Okendo to roll-out a major upgrade to their customer content strategy. Beginning by addressing the quality of customer reviews, Country Chic Paint developed a range of preconfigured questions and possible answers which customers could choose from during the review capture process. These questions would prompt customers into providing deeper insights into the specific aspects of the product ownership experience that other shoppers were most interested in understanding. Giving customers the ability to add their social media profile picture added significant credibility to reviews, with shoppers now able to see the human behind the review, further helping to nurture the sense of customer community among makers and creators which Country Chic Paint is known for. Knowing Country Chic Paint customers were responsive to coupon incentives, the next optimization was implementing a tiered incentive system which would encourage customers to enhance review quality. Rather than a single coupon, customers could earn a coupon upgrade by adding more content to their review. A standard text entry review would earn a 10% discount coupon while a review with pictures and videos would earn a 15% discount. This clever use of incentives was highly effective, with Country Chic Paint generating a marked increase in customer reviews with photos and videos. 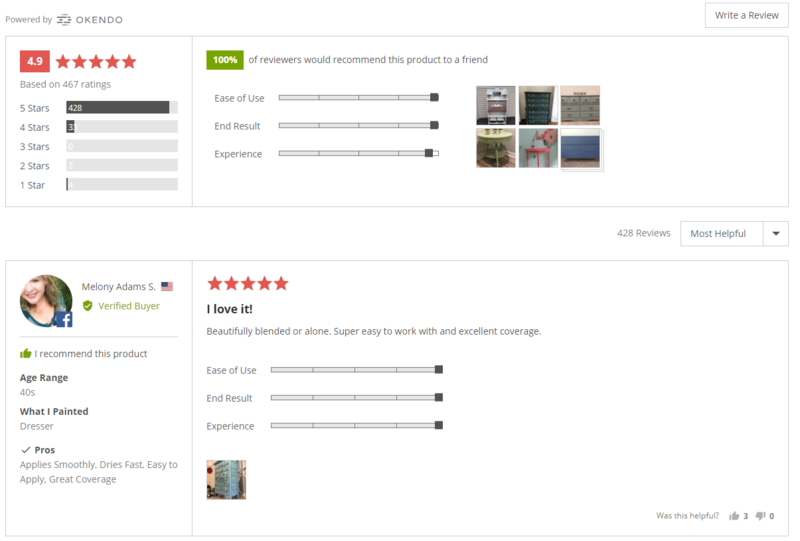 Lastly, the aesthetic of customer reviews throughout the Country Chic Paint site received a major overhaul. The elegant Okendo product page widget was customised to seamlessly fit the Country Chic Paint brand environment, including matching fonts, colours and sizing guidelines. To further leverage the impact of customer content across the buying journey, Country Chic Paint also deployed a range of Okendo customer content highlight widgets. A homepage carousel would cycle through a combination of most recent and top rated reviews in order to send an immediate trust signal to new shoppers unfamiliar with the Country Chic Paint brand and to highlight customer feedback on new products. Finally, a dedicated Reviews page would showcase all of Country Chic Paint’s customer content while also giving shoppers the ability to see an aggregate of reviews across key product collections. "Okendo has been fantastic! We are really happy with the improvements it has brought to our customer reviews. The team at Okendo are also super helpful; when ever I had any questions or suggestions, I found they were either already working on it or they were happy to add suggestions to their feature schedule. It's great to see how quickly Okendo is growing, highly recommended!"